Often called a stiff or “frozen shoulder,” adhesive capsulitis occurs in about 2% to 5% of the American population. It affects women more than men and is typically diagnosed in people over the age of 45. Of the people who have had adhesive capsulitis in 1 shoulder, it is estimated that 20% to 30% will get it in the other shoulder as well. Physical therapists help people with adhesive capsulitis address pain and stiffness, and restore shoulder movement in the safest and most effective way possible. Often, however, there is no clear reason why adhesive capsulitis develops. Most people with adhesive capsulitis have worsening pain and a loss of movement. Adhesive capsulitis can be broken down into 4 stages; your physical therapist can help determine what stage you are in. During stage 1 of its development, it may be difficult to identify your problem as adhesive capsulitis. You've had symptoms for 1 to 3 months, and they're getting worse. Movement of the shoulder causes pain. It usually aches when you're not using it, but the pain increases and becomes "sharp" with movement. You'll begin to limit shoulder motion during this period and protect the shoulder by using it less. The movement loss is most noticeable in "external rotation" (this is when you rotate your arm away from your body), but you might start to lose motion when you raise your arm or reach behind your back. Pain is the hallmark feature of this stage; you may experience pain during the day and at night. By this stage, you've had symptoms for 3 to 9 months, most likely with a progressive loss of shoulder movement and an increase in pain (especially at night). The shoulder still has some range of movement, but it is limited by both pain and stiffness. Your symptoms have persisted for 9 to 14 months, and you have a greatly decreased range of shoulder movement. During the early part of this stage, there is still a substantial amount of pain. Toward the end of this stage, however, pain decreases, with the pain usually occurring only when you move your shoulder as far you can move it. You've had symptoms for 12 to 15 months, and there is a big decrease in pain, especially at night. You still have a limited range of movement, but your ability to complete your daily activities involving overhead motion is improving at a rapid rate. 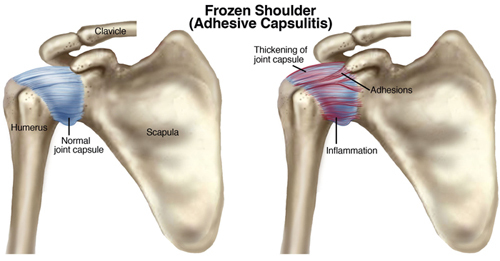 Often, physical therapists don't see patients with adhesive capsulitis until well into the freezing phase or early in the frozen phase. Sometimes, people are being treated for other shoulder conditions when their physical therapist notices the signs and symptoms of adhesive capsulitis. Your physical therapist will perform a thorough evaluation, including an extensive health history, to rule out other diagnoses. Your physical therapist will look for a specific pattern in your decreased range of motion called a "capsular pattern" that is typical with adhesive capsulitis. In addition, your physical therapist will consider other conditions you might have, such as diabetes, thyroid disorders, and autoimmune disorders, that are associated with adhesive capsulitis. Exercises and manual therapy. Your physical therapist will help you maintain as much range of motion as possible and will help reduce your pain. Your therapist may use a combination of range-of-motion exercises and manual therapy (hands-on) techniques to maintain shoulder movement. Modalities. Your physical therapist may use heat and ice treatments (modalities) to help relax the muscles prior to other forms of treatment. Home-exercise program. Your physical therapist will give you a gentle home-exercise program designed to help reduce your loss of motion. Your therapist will warn you that being overly aggressive with stretching in this stage may make your shoulder pain worse. Your physical therapist will match your treatment activities and intensity to your symptoms, and educate you on appropriate use of the affected arm. Your therapist will carefully monitor your progress to ensure a safe healing procedure is followed. Pain medication. Sometimes, conservative care cannot reduce the pain of adhesive capsulitis. In that case, your physical therapist may refer you for an injection of a safe anti-inflammatory and pain-relieving medication. Research has shown that although these injections don’t provide longer-term benefits for range of motion and don’t shorten the duration of the condition, they do offer short-term pain reduction. Stretching techniques. Your physical therapist may introduce more intense stretching techniques to encourage greater movement and flexibility. Manual therapy. Your physical therapist may take your manual therapy to a higher level, encouraging the muscles and tissues to loosen up. Strengthening exercises. You may begin strengthening exercises targeting the shoulder area as well as your core muscles. Your home-exercise program will change to include these exercises. Stretching techniques. The stretching techniques in this stage will be similar to previous ones you’ve learned, but will focus on the specific directions and positions that are limited for you. Manual therapy. Your physical therapist may perform manual therapy techniques in very specific positions and ranges that are problematic for you. They will focus on eliminating the last of your limitations. Strength training. Your physical therapist will prescribe specific strengthening exercises related to any weakness that you may have to help you perform your work or recreational tasks. Return to work or sport. Your physical therapist will address movements and tasks that are required in your daily and recreational life. The cause of adhesive capsulitis is debatable, with no definitive cause. Therefore, to date, there is no known method of prevention. The onset of the condition is usually gradual, with the disease process needing to "run its course." However, the sooner you contact your physical therapist, the sooner you will receive appropriate information on how to most effectively address your symptoms. Cheryl is 47-year-old office manager who swims and hikes on the weekends. A few months ago, Cheryl began having pain in her left shoulder when she reached up to file archived reports at work. At first she ignored it, but then noticed her shoulder was aching after work and sometimes at night. She began to limit her movement due to pain. Just this week, she chose not to visit her local pool for her regular swim. She decided to contact a physical therapist. Cheryl’s physical therapist took her health history, and asked her to describe when the pain began, and how her current symptoms are affecting her. Cheryl reports no accident or trauma, and that the pain has slowly increased over the past few months. She notes that she has to make adjustments at work because she can’t lift her arm above shoulder level, and that the pain is now affecting her sleep. Her physical therapist conducts a thorough physical examination and diagnoses stage 2 frozen shoulder (adhesive capsulitis). He begins Cheryl’s rehabilitation with heat treatments to relax her muscles, and designs an individualized home-exercise program to address her symptoms and help stall any loss of motion. He encourages Cheryl to perform her home exercises every day. Cheryl’s treatments during this phase consist of gentle movements performed by her physical therapist (manual therapy), to help maintain the shoulder joint’s current range of motion. At this point, he focuses treatment not on increasing the shoulder’s range of motion, but on mobilizing the joint to reduce pain and reduce the amount of movement that is lost. When Cheryl progresses into stage 3 ("frozen") adhesive capsulitis, her visits to the physical therapist are increased. He uses stretching and manual therapy techniques to improve her range of motion. He updates Cheryl’s home-exercise program to match her current limitations and function. After a few more weeks of treatment, Cheryl reports minimal pain, and her range of motion is beginning to increase. Her treatment is reduced to weekly visits, and then to twice monthly visits. She begins to slowly return to swimming; her physical therapist prescribes a safe and appropriate program to follow, as she resumes her activities. After 2 more months of treatment, Cheryl’s range of motion is normal, and her pain has stopped. She has happily returned to her regular swimming schedule, and feels stronger than she has in years! Cheryl's physical therapist credits her excellent recovery to her full participation in her treatment and home-exercise programs. A physical therapist who is a board-certified clinical specialist or who completed a residency or fellowship in orthopaedic physical therapy, manual physical therapy, or specializes in the treatment of the upper extremity. This therapist has advanced knowledge, experience, and skills that may apply to your condition. When you contact a physical therapy clinic for an appointment, ask about the physical therapist's experience in helping people with frozen shoulder. The following articles provide some of the best scientific evidence related to physical therapy treatment of adhesive capsulitis. The articles report recent research and give an overview of the standards of practice for treatment of adhesive capsulitis both in the United States and internationally. The article titles are linked either to a PubMed abstract of the article or to free full text, so that you can read it or print out a copy to bring with you to your health care provider. Jain TK, Sharma NK. The effectiveness of physiotherapeutic interventions in the treatment of frozen shoulder/adhesive capsulitis: a systematic review. J Back Musculoskelet Rehabil. 2014;27:247–273. Article Summary in PubMed. Russell S, Jariwala A, Conlon R, et al. A blinded, randomized, controlled trial assessing conservative management strategies from frozen shoulder. J Shoulder Elbow Surg. 2014;23:500–507. Article Summary in PubMed. Rill BK, Fleckenstein CM, Levy MS, et al. Predictors of outcome after nonoperative and operative treatment of adhesive capsulitis.Am J Sports Med. 2011;39:567–574. Article Summary in PubMed. Neviaser AS, Hannafin JA. Adhesive capsulitis: a review of current treatment. Am J Sports Med. 2010;38:2346–2356. Article Summary in PubMed. Jewell DV, Riddle DL, Thacker LR. Interventions associated with an increased or decreased likelihood of pain reduction and improved function in patients with adhesive capsulitis: a retrospective cohort study. Phys Ther. 2009;89:419–429. Free Article. Kelley MJ, McClure PW, Leggin BG. Frozen shoulder: evidence and a proposed model guiding rehabilitation. J Ortho Sports Phys Ther. 2009;39:135-148. Article Summary in PubMed. Levine WN, Kashyap CP, Bak SF, et al. Nonoperative management of idiopathic adhesive capsulitis. J Shoulder Elbow Surg. 2007;16:569–573. Article Summary in PubMed. Sheridan MA, Hannafin JA. Upper extremity: emphasis on frozen shoulder. Orthop Clin North Am. 2006;37:531–539. Article Summary in PubMed. Diercks RL, Stevens M. Gentle thawing of the frozen shoulder: a prospective study of supervised neglect versus intensive physical therapy in seventy-seven patients with frozen shoulder syndrome followed up for two years. J Shoulder Elbow Surg.2004:13:499–502. Article Summary in PubMed.